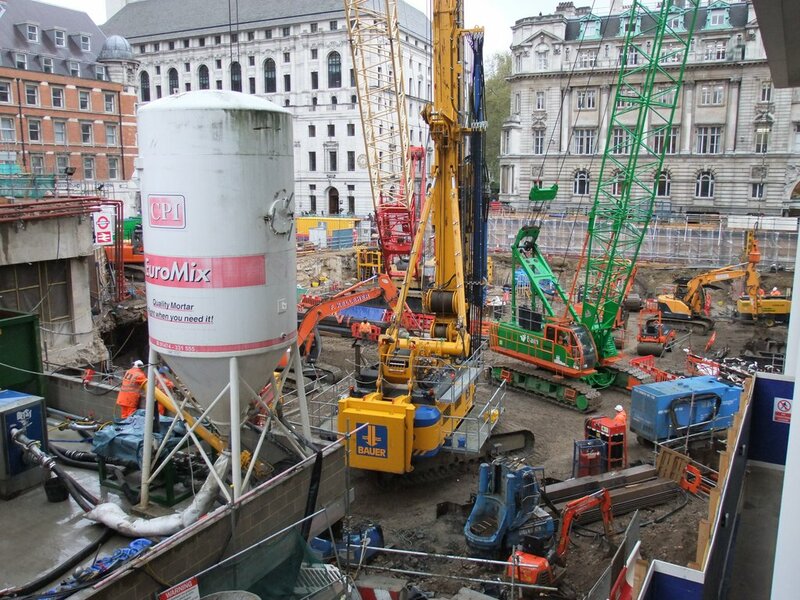 I stopped off in Moorgate on my way past earlier this week to check up on progress of the works to construct an access shaft immediately outside Moorgate Underground Station. 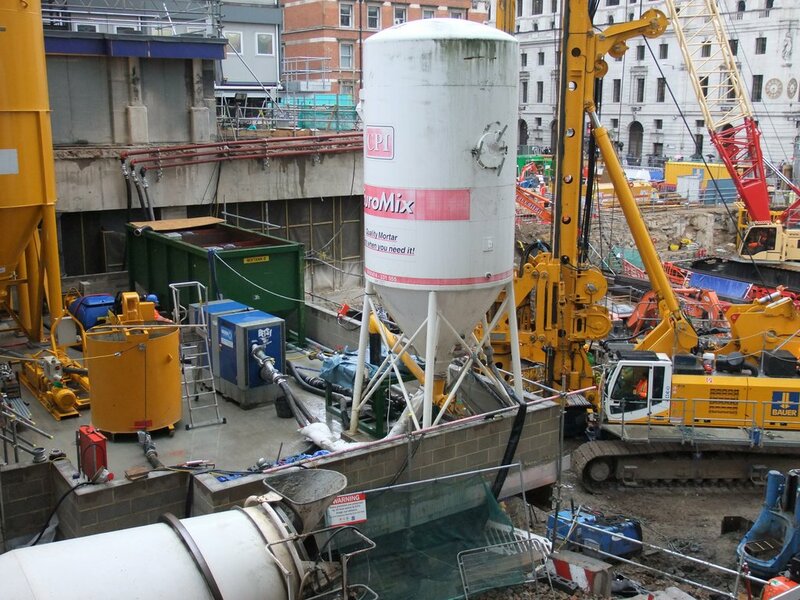 The shaft is part of the Crossrail project and will form part of the eventual Liverpool Street Crossrail Station. The works appear to be progressing well despite the recent bad weather. 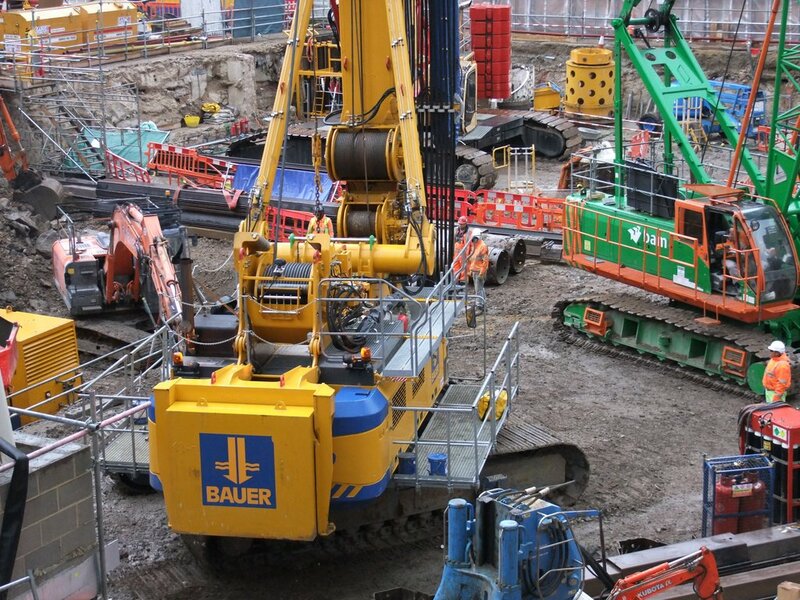 Steel sheet piles have been installed to the hold up the ground beneath us when excavation of the shaft takes place proper (not for a while yet) and the existing building foundations all seem to have gone (except maybe for the existing piles). 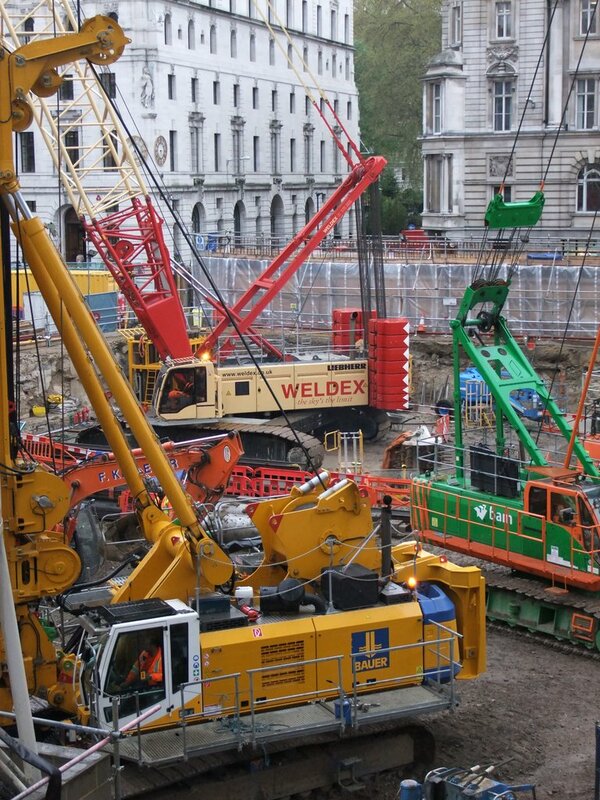 The steel sheet piles have been installed using a ‘silent piler’ – see photo below. 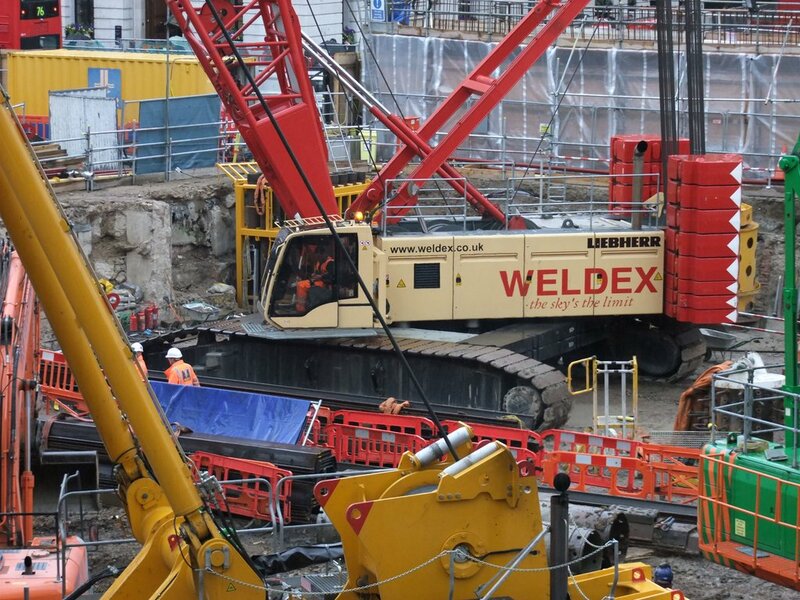 The current work appears to be focussing on diverting an existing sewer that runs through the site and that is in the way of the diaphragm walling operations that will soon be starting. Other than that nothing much appears to be happening. Unfortunately on such a small site there is little option but to do items of work one step at a time – there is little opportunity for concurrent activities. Once the sewer is diverted the works will progress rapidy so if you are interested in following this project it would be worth calling in a few times in the next few months – and you can see the works really clearly from the ‘Highwalk’ bridge where I was standing to take the photos. Exit Moorgate Station and turn right then up the escalator onto the highwalk then turm immediately left and you will see the site. I have uploaded an album of photos to my Piacasaweb photo sharing site here. 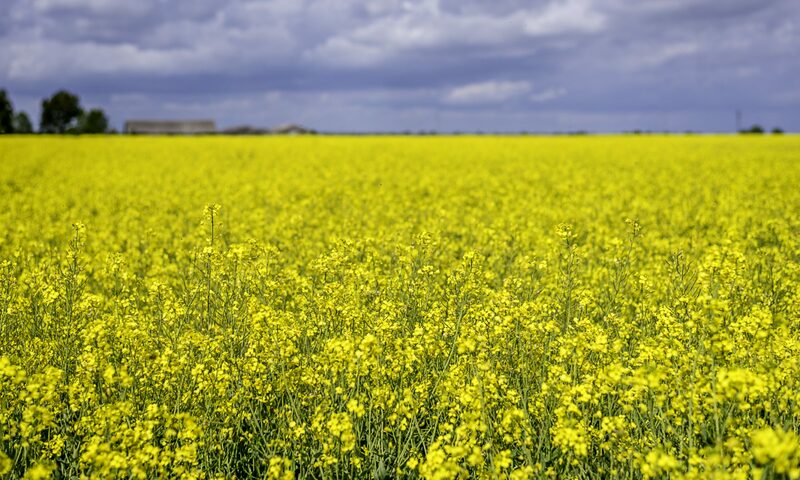 Included below are a selection of those photos which all open to larger versions in a new window on clicking. 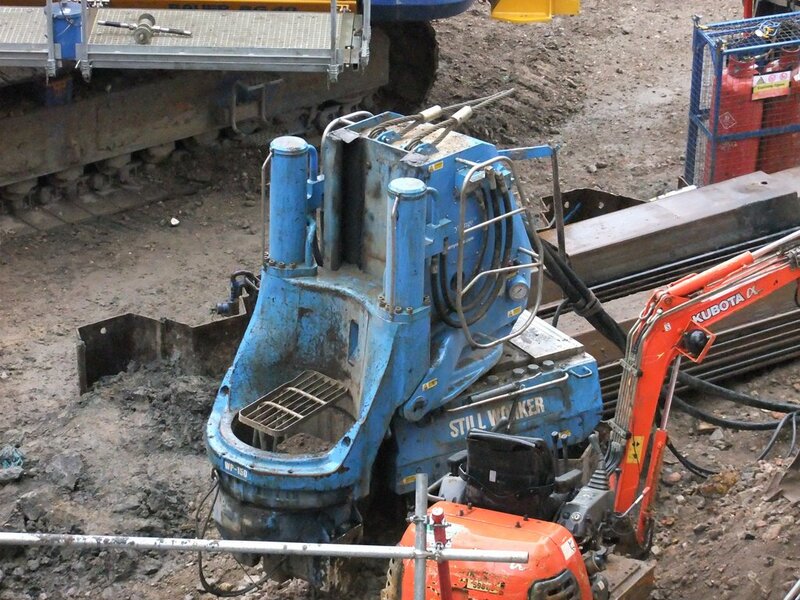 This is a rotary piling machine. It augers out material using the 'drill bit' you can see. the hole is then filled with concrete. This is a 'silent' piler for installing steel sheet piles (the meatl things in the ground behind it). 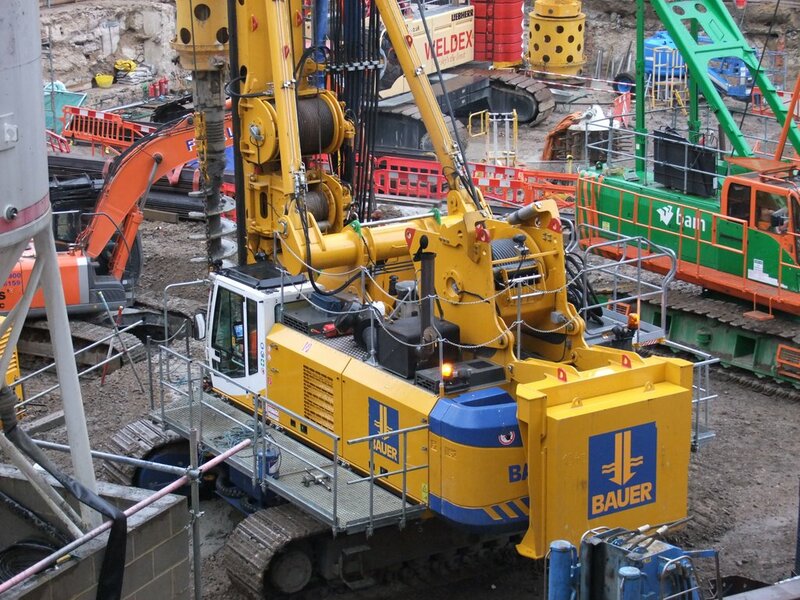 It pushes the piles into the ground using strong hydraulic rams rather than bashing them into the ground and hence is much quieter for built up areas. Another view of the site. White silo is for dry mix mortar. Orange silos far left are for water and/or bentonite slurry which is used in the piling process. 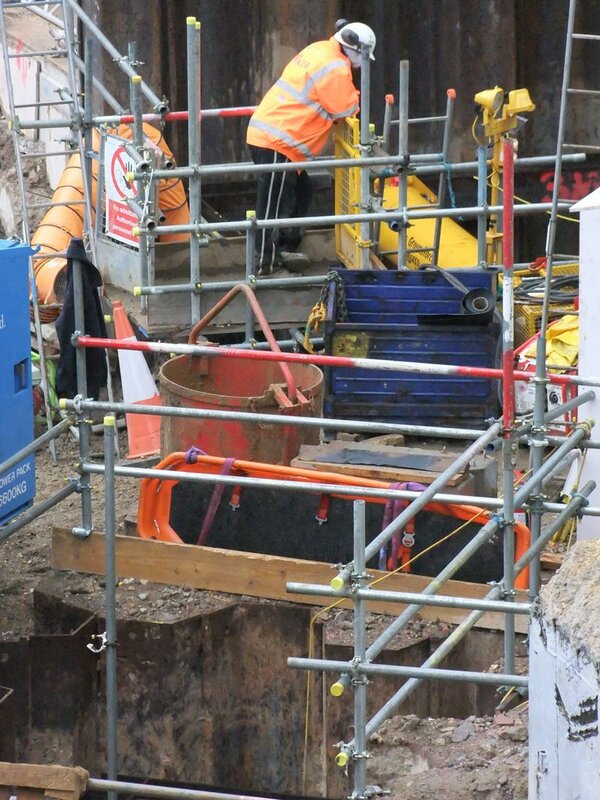 Man is looking down into an hole in which work is being carried out to divert a big sewer that runs through the site and that needs diverting. 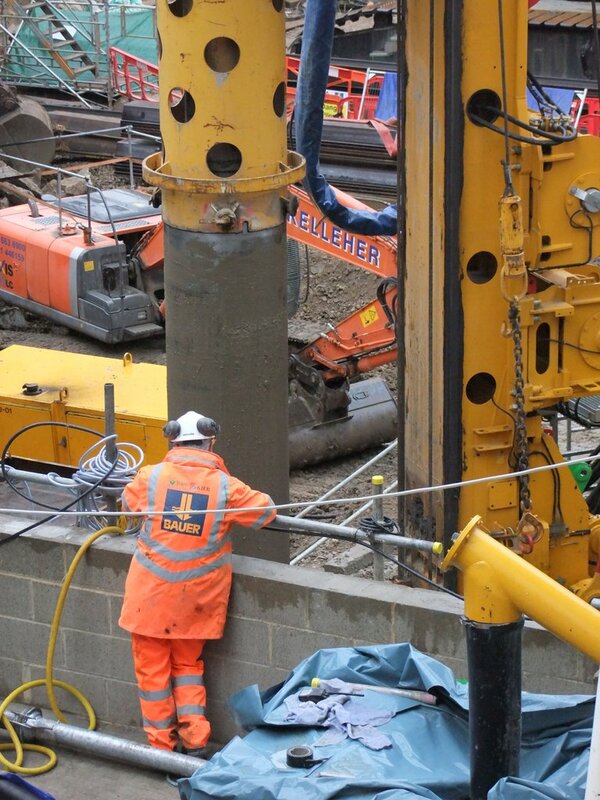 Close up of business end of the rotary piling rig. The grey tube is temporary casing that is installed as the auger drills out the ground. The casing stops the ground falling into the hole and is removed once the concrete is poured. Close up of excavator being used to remove waste material from the lower level of the site. 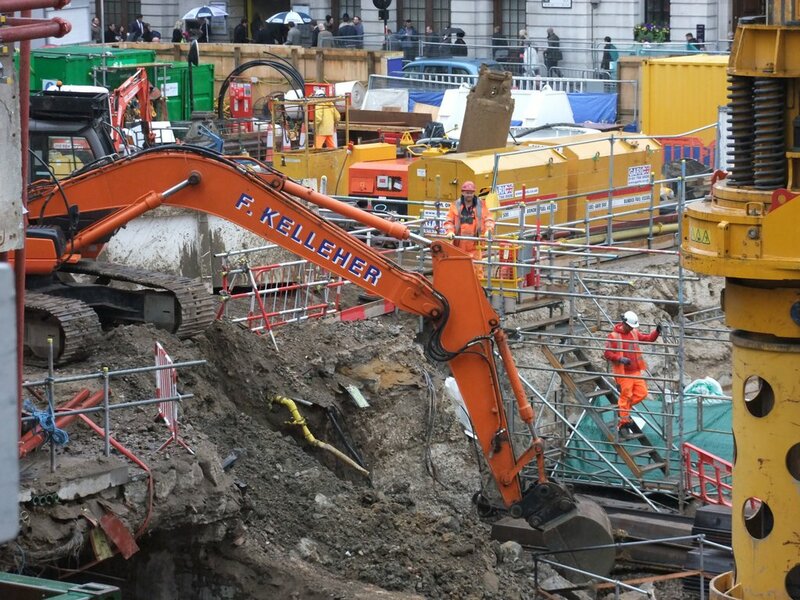 The excavator is sitting directly above the circle line underground tracks on wat is called a 'covered way' eg the tracks have been covered over. Like a tunnel but slightly different. Thanks for the blog…..walked past the site a few times and wanted to know what was happening. Amazing that people who work near by have no idea what’s happening. All very interesting!